Lima Central Catholic's Matthew Cecala drives to the basket Saturday night against Ottawa-Glandorf's Carter Heringhaus during Saturday night's game at LCC. 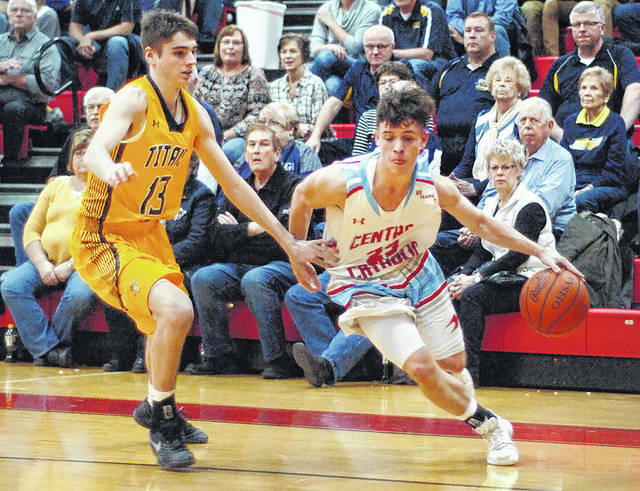 LIMA — Lima Central Catholic had gained control. Then, just like that, Ottawa-Glandorf’s rebound, run and press game swarmed all over the T-Birds. Suddenly, the LCC lead melted away. O-G wiped away a 10-point, fourth-quarter deficit to notch a 55-51 boys basketball victory over LCC Saturday at Herr Gymnasium. LCC led 48-38 with 6:55 to go. From there, O-G outscored LCC 17-3. O-G is 5-0. LCC is 3-2. Both teams were coming off Friday night wins. O-G defeated St. Marys, while LCC downed Delphos Jefferson. 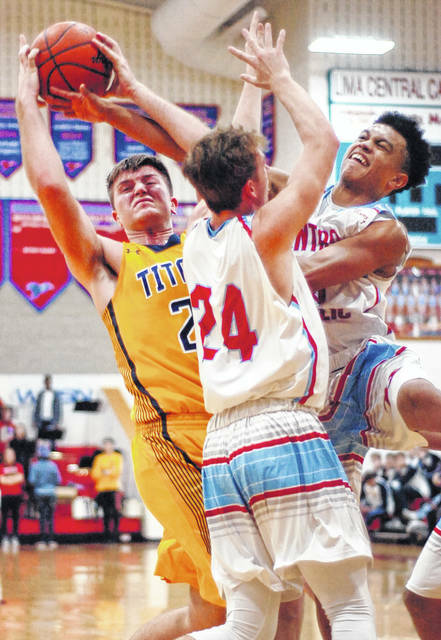 LCC, which used its speed and quickness to take the lead, continued to fly into the frontcourt in the final minutes, but had a few key turnovers along the way. LCC ended up with 20 turnovers, as O-G kept switching presses from zone to man to zone. O-G won the glass, especially in the second half, outrebounding LCC 32-28, including 15-8 at the offensive end. “Rebounding was key,” LCC coach Frank Kill said. “That was the number-one key on our board. If they had second-chance opportunities, that would be the ballgame. We didn’t box out. Jake Dible had 15 points and seven rebounds for the Titans. Guard Owen Hiegel had 14 points. Ethan White had 12 points and 11 rebounds, with seven boards coming on the offensive end. White scored seven points in the fourth quarter. White had a 7-foot putback, a 5-footer and two foul shots in the key 15-3 run when the Titans took the lead at the end. O-G took the lead to stay 52-51 on a Bryce Schroeder fast-break layup, off a turnover, with 43 second to go. Richie Knowlton’s two foul shots made it 54-51 Titans with 18 seconds left. Biggz’ Johnson missed a runner in the lane with five seconds to go for LCC. Mark Janowksi had 12 points, seven rebounds and three blocks for LCC. Raoul Samaroo had 11 points, while Johnson scored 10. De’Montre Garner had eight points and five rebounds. The Titans entered the night scoring 82 points per game. And they ran out to a quick 8-2 lead. But LCC’s defense clamped down in its man-to-man. Offensively, LCC then went on a 12-0 roll, as it weaved its way through the O-G press. Starting the bustout was Janowski’s 3-pointer and putback. Samaroo then had a putback. Garner and Johnson both had fast-break layups and the T-Birds took a 14-8 lead. LCC led 16-15 after the first quarter. O-G began going inside-out to 6-foot-6 Dible and he responded with 10 first-half points. O-G led 28-27 at the half. https://www.limaohio.com/wp-content/uploads/sites/54/2017/12/web1_121617LCCboysOGbball03cardinal.jpgLima Central Catholic's Matthew Cecala drives to the basket Saturday night against Ottawa-Glandorf's Carter Heringhaus during Saturday night's game at LCC. This entry was tagged limacentralcatholic, ottawaglandorf. Bookmark the permalink.